Floyd Fence specializes in Aluminum Custom fences for Tri-county (including Summerville) residents that wish to protect their homes with quality constructed fences that add beauty and style to the overall look of their most important investment. Not all fences are created equal! All of our fences are constructed with enduring quality in mind. Our reputation is how the majority of our business is derived. We use only 6x6 posts on all gates Stringers (horizontal 2x4's) are 8' rather than 16' to reduce warpage. Each post receives at least 40lbs of concrete Gates are constructed separate from the fence (not built into the fence and cut out) We use only ring shanked, double dipped galvanized nailes We pride ourselves on being on time and completing our work in a dependable and honest manner. 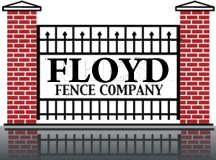 You will find that our employees are uniformed, professional and will leave your site in the best possible condition, allowing you to enjoy your fence rather than clean up your yard.